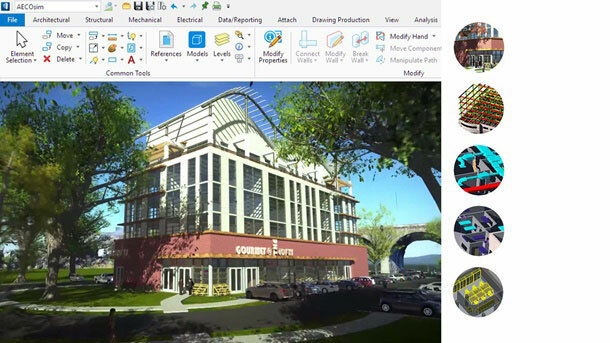 AECOsim Building Designer CONNECT Edition is Bentley’s premier multidiscipline building design application for enabling BIM processes for design, engineering analysis, document production, and visualization. It provides integrated tools for architects, structural, mechanical, and electrical engineers. Exton, Pa., — Bentley Systems, Incorporated announced the availability of AECOsim Building Designer CONNECT Edition, Bentley’s building information modeling (BIM) application designed for building projects of significant size and/or engineering complexity, and which are typically characterized by the challenges of combining vertical construction and horizontal infrastructure (like roads, railways, utilities, etc.). On such projects, design and project delivery firms often have broad responsibilities for multiple project delivery disciplines and across subcontractors and joint-venture organizations. GenerativeComponents installs as a Product Companion feature within AECOsim Building Designer. It provides computational design to explore iterative design ideas and embed design intent with design constraints and relationships. AECOsim Building Designer CONNECT Edition integrates the work of architects, structural engineers, and MEP engineers in a single application, and now extends its scalability by leveraging CONNECT Edition’s comprehensive modeling environment. The new release provides seamless, translation-free, intra-operability with Bentley’s full multidiscipline portfolio of design, analytical, and construction modeling applications. Bentley LumenRT is a companion application to create stunning visualizations to both enliven and help communicate designs. Available to all Bentley application subscribers, CONNECTservices represent Bentley’s commitment to address the requirements that its user organizations face in going digital. In a digital world, users learn differently, take their work wherever they go, and collaborate with highly diverse and dispersed teams. Leveraging Microsoft Azure, CONNECTservices are fundamental to the use of any Bentley application. Learn more about CONNECTservices at https://www.bentley.com/en/perspectives-and-viewpoints/topics/campaign/select-connect. For more information about AECOsim Building Designer CONNECT Edition, visit www.bentley.com/aecosimbuildingdesigner.